Prolab NLarge weight gainer - Prolab N-Large weight gainer Is a great weight gainer- N-Large weight gainer has an excellent ratio of 2:1 Carbohydrate to Protein. With regards to flavours, I personally find Chocolate the best, Strawberry is OK, and Vanilla can be a little hard going by the time you are nearing the bottom of the tub. NLarge weight gainer comes in a 6 lb size. These tubs have 18 servings of N-Large weight gainer per tub. Not much you might think, but considering each serving is about 600 Kcal when mixed with water, split one serving up and have half (2 scoops) A.M. and half before bed. For those with a high metabolism I'd suggest 3 scoops of N-Large weight gainer AM and 3 scoops of N-Large weight gainer before bed, in addition to regular meals. Still available in Chocolate, Strawberry and Vanilla. N-Large weight gainer also makes for a great easy to use post workout meal when mixed with water. You can even add spoon of Creatine in with it for extra benefit. 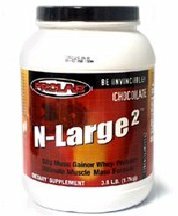 NLarge weight gainer is a powerful mass gaining formula designed to pack size on the hardest gainers. This potent formula delivers more calories and protein, gram for gram, than our competition. We put an emphasis on the amount of protein per serving since it is the only nutrient proven to assist in promoting muscle mass. We use only cross flow, micro filtered, cold processed ion exchanged whey protein. This protein has a superior amino acid profile, an unbeatable bioavailability, is low in lactose and is instantised for easy mixing without a blender. You simply will not find a protein of this grade used in other weight gain formulas. We have avoided overloading our formula with carbohydrates. We use just enough to help fuel your workouts and replenish depleted glycogen stores, but not enough to cause drowsiness. Studies show that too many carbohydrates increases the levels of serotonin crossing over the brain barrier, thereby inducing drowsiness. Fat, although shunned by some, is highly concentrated energy source (double that of protein and carbohydrates) supplying the body with fat soluble vitamins A, D, E, and K. Fat is also a necessary component of all cell membranes, nerve covering, digestive secretions and most importantly, hormone production. A diet too low in fats may actually impair growth (For these reasons, small amounts of necessary dietary fat is contained in NLarge weight gainer). Combine NLarge weight gainer with a sensible diet and intense training program for best overall gains. Ingredients: Maltodextrin, cross-flow micro-filtered cold processed ion exchanged whey, fructose, natural flavoring. Additional Information: Vanilla, Chocolate, and Wild Berry.